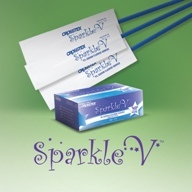 Sparkle V is a 5% sodium fluoride varnish indicated for dentin sensitivity. It is designed to be great tasting and to dry to a natural tooth shade. Sparkle V contains Xylitol and is gluten-, aspartame- and saccharin-free. It is dispensed in single-dose packages with bendable brush applicators. Each box contains 120 unit doses in bubble gum flavor with manufacturer’s instructions. Sparkle V was evaluated by 44 consultants in 1025 uses. It received a 91% rating. Sparkle V applies smoothly to tooth surfaces without the clumping that similar products exhibit. 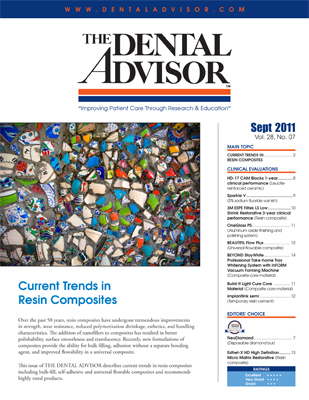 After application, no color is visible on the teeth. Consultants used Sparkle V as a fluoride treatment during hygiene appointments and found it effective in reducing dentin sensitivity in adults. The majority of patients liked the bubblegum flavor, but some found it too sweet; hygienists would like other flavors. Some of the brushes fell out of the unit-dose packets in the box, resulting in consultants’ opinions that the packaging could be improved. Thirty-nine percent of consultants reported that Sparkle V was better than their current fluoride varnish and 36% reported that it was equivalent. Sixty-six percent would switch to Sparkle V and 77% would recommend it. Make sure teeth are dry during application.